Irish Prime Minister (Taoiseach) Leo Varadkar has said a deal between the EU and UK on the border can be done by within weeks. 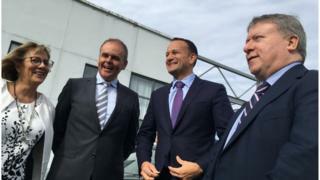 He was speaking at the announcement of 90 new jobs at an engineering company in County Donegal. E+I Engineering is investing 9.5m euro (£8.46m) in its plant in Burnfoot. The Taoiseach said he agreed with Michel Barnier's assessment that a Brexit deal is possible within six to eight weeks. "We need to do it too because you know the longer we leave it the longer we wait until we have an agreement," Mr Varadkar added. He insisted a deal was possible in October but "may well run into November". Mr Varadkar said people needed certainty around a transition period and a legally operable backstop option. The Taoiseach added delays to an agreement only increased the uncertainty for businesses on the border and those workers who crossed it daily. Clarity on Brexit would "create a better environment for the parties to form an executive" in Northern Ireland," he said. E+I Engineering, whose workforce comes from both sides of the border, is a global leader in the critical power distribution sector. It operates in 40 countries, designing and making systems for a worldwide market. The multimillion euro investment by the company will lead to the creation of new roles in engineering, project management and production in Donegal. It employs 1,700 staff around the world - just under half of those are based in the north-west plant. E&I's managing director Philip O'Doherty said the expansion will allow the company to develop new products and improve existing ones. "It is an ongoing process that we are going through to increase the size of this company," he said. The new posts are supported by Enterprise Ireland. This is the latest in a series of research and development projects instigated by the company since 2004. They have been rolled out across its plants in Ireland, the United Arab Emirates and the United States. E+I Engineering has worked with some of the leading names in commerce and healthcare from Rolls Royce and Barclays to the NHS. However, Mr O'Doherty has warned in the past about the dangers of a hard Brexit. He said E&I is prepared for the UK's withdrawal from the EU. "We are confident that the products we have will be required before and after Brexit. "It is a challenge no doubt, but we are confident this company will continue to prosper," he said. On Monday, Alchemy Technology announced plans to set up a new centre of excellence in Londonderry which will lead to 250 jobs.